It’s strange how a group of plants suddenly grabs you. August is the month of BYD’s. . . .eh?. . . Big Yellow Daisies to the uninitiated. All the heleniums, helianthus, helichrysums, helianthemums (well done, a cistus family relative not a daisy). We’d got Helianthus ‘Lemon Queen’ but that was about it. We weren’t worried but we were missing a trick. Pettifers had been ticking along nicely, doing August rather well, with our grasses and asters, a sudden need for punchy colour would be filled by shoehorning in some crocosmias. 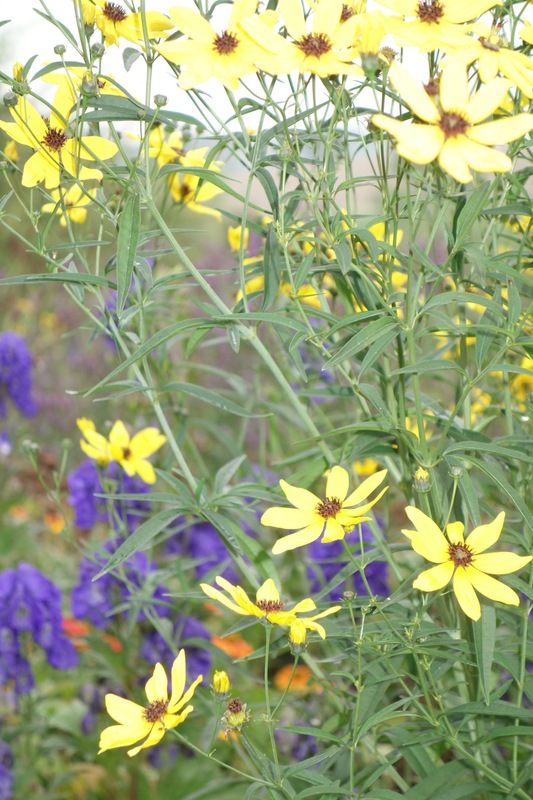 Then, in a magazine, Gina saw Coreopsis tripteris. We did a mutual raising of eyebrows, a sly smile passed between us and we raced off to the Autumn Border – Gina won, she sent me back to get bamboo canes as markers just as I rounded the last corner a nose in front. That was 2 years ago. The plants we bought sailed through their first summer and then through a very wet winter increasing in girth very well. This spring we decided we wanted more and so split the biggest 2 plants and moved the other 2 around to create more of a swathe rather than the 4 clumps we had before. As a result, this summer they have surpassed themselves with a good 3-4 months of golden yellow daisies on 6′ stems, waving gently in the wind – sturdy but still ‘see-throughable’. The Autumn Border is huge, very deep and all the plants are nearing 6′ (our groundcover is Aster ‘Sonora’ at 3′) so Coreopsis tripteris fits in as a touch of yellow, not as a bold statement plant as it would in a smaller border. But it would work in a smaller border, yes it’s 6′, but it’s vase shaped, delicately leaved with a sprinkling of flowers and the stems are well-spaced – it’s like Verbena bonariensis in form, only on steroids! In drier soil or a drier/hotter summer it would be shorter. Frequent division seems likely to benefit it, it certainly didn’t like being crammed in the pot from the nursery, but then that’s typical of members of the daisy family. So for us, Coreopsis tripteris has ticked all the right boxes.